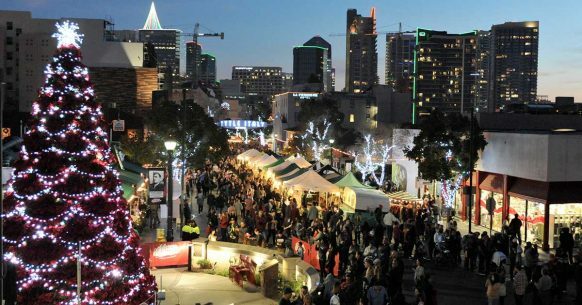 Celebrate the upcoming weekend in San Diego enjoying all the Holiday Cheer California’s Beach City has to offer including these top things to do. Get ready to sample the tastiest ramen, enjoy live cultural performances and witness a ramen eating contest at the 3rd Annual San Diego Ramen Festival. Celebrate the season at Liberty Station’s Annual Tree Lighting & Holiday Festivities in the North Promenade. The community is invited to enjoy the holiday magic with an 88-foot Norfolk pine tree lighting, a Holiday Marketplace with local vendors, Christmas carolers, pictures with Santa, a viewing of How The Grinch Stole Christmas and more! After the sun goes down in December, the Garden is transformed into a dazzling winter wonderland with sparkling lights illuminating the Garden for a magical holiday experience. Leave the hustle and bustle of the malls behind and enjoy a relaxing evening, strolling the lighted Garden. Celebrate the holidays with the rescued animals of Lions Tigers & Bears. Watch as lions, tigers, bears, mountain lions, leopards, bobcats and other sanctuary animals open their holiday gifts and enjoy their new Christmas trees. This is a great festive day to enjoy an educational visit with magnificent rescued animals. All proceeds benefit rescued animals and animal rescue work. Setting Sun Sake Brewing Co. will be hosting a day of celebration and collaboration to showcase some of what America’s Finest City has to offer at one of its most iconic locations: the Japanese Friendship Garden in Balboa Park. Day time events include exhibitions, performances, and chefs sharing Japanese culture with a San Diego flair. We have invited a few of our brewer friends to join in on our day of festivities and will conclude with a “Chef dinner” in the evening! Every year, the Center brings the North Pole to the heart of Escondido. Children will have the chance to frolic in real snow, create winter-themed arts and crafts, and even rendezvous with live reindeer! Celebrate the season during Little Italy’s Christmas Tree Lighting Ceremony and see our unique Christmas Tree – a 25-foot tower of 1,100 gorgeous Poinsettias. The festive and fiery SoNo Fest & Chili Cook-Off promises everything a person could want in a fun day including craft beer, wine, shopping music and chili!